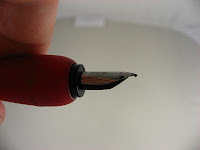 I'll leave you this week with a look at an odd fountain pen that I picked up a long time ago. 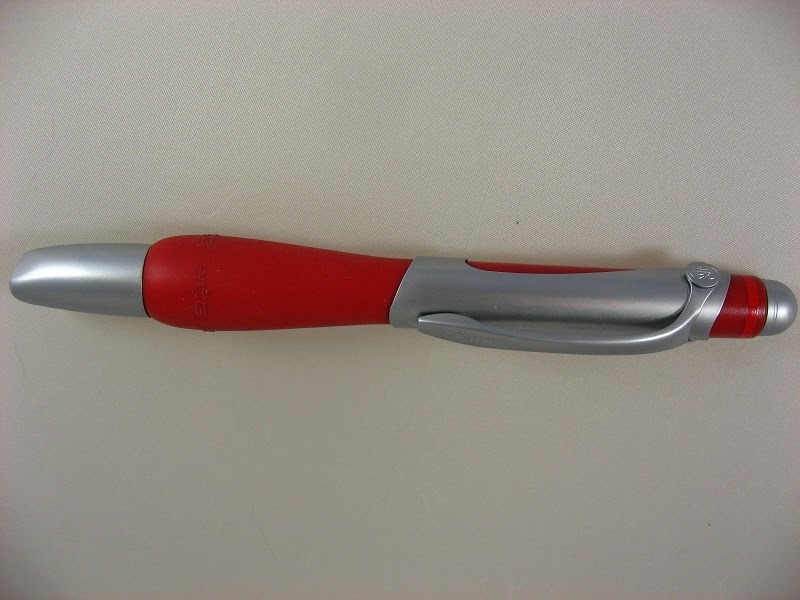 It's a Rotring pen, and if you want one you'll have to find one online since they've stopped making most of their fountain pens. They seem to be around the $30 mark these days, though I don't think I paid anything like that for it back in the day. You're going to get really mixed reviews on these pens. They have some idiosyncratic features that you're liable to love or hate. 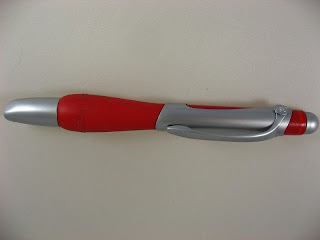 The grip is big and soft, and I kinda wish that this grip was on more pens. The nib is listed as an "XL," but that can't mean extra large. 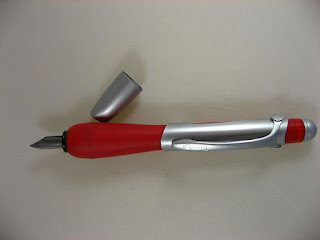 It lays down a line that is much closer to a Lamy Medium than any of the broader nibs that I've used. 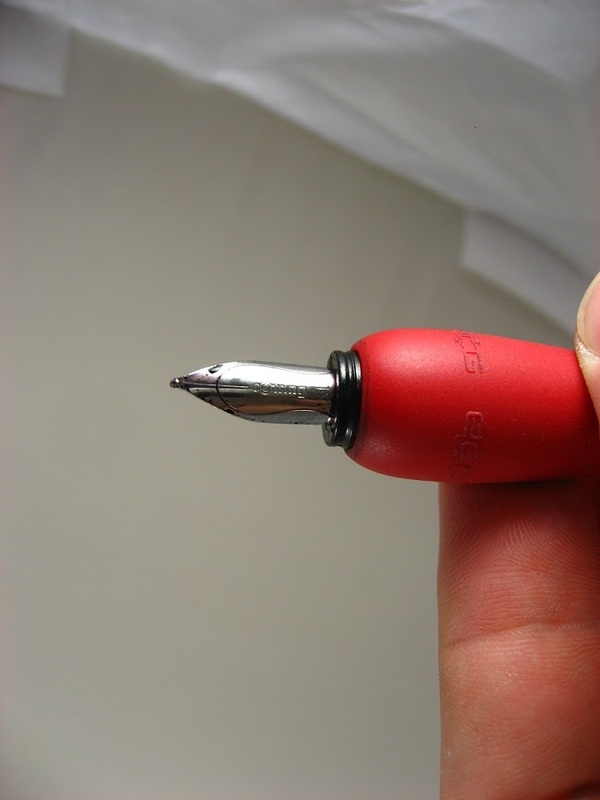 The nib is steel, and there really isn't any flex at all. You can remove the nib and the feed to clean them, and that's really convenient. The cap fits very tightly. It's not falling off. In fact, it is a little difficult to remove. You need to kinda push it off to the side with your thumb. It's nice that it's a tight fit, but I used to be a bit worried that it would hit the nib and break it off. On the other hand, you can't post the cap. 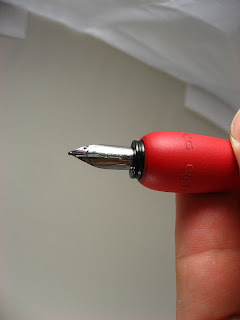 It's small, and I can imagine losing it at some point if you're careless with where you place the cap while you're writing. It's a bit of a dry-writer, but once you get the right ink in it it's just fine. I'd love to tell you what ink I'm using in the pictures, but I don't know what it is. I think it might have been Levenger's Fireball, but that ink changes colors on me so I don't know for sure. I'll write a post about that color-shifter soon. Michael A. Stackpole's "In Hero Years...I'm Dead"